I have made no secret of my love for smokehouse food in the past, my work with Rub smokehouse and visit’s to other local restaurants in recent times have done nothing if not made me even more passionate about BBQ. I have been reading article after article about smoking and the best type of equipment to use and even how to make you’re own smoker, but I eventually came to the decision that I was going to buy a cheaper unit and modify it as a bit of a project to gradually get the best out of it and tweak it as I learn. 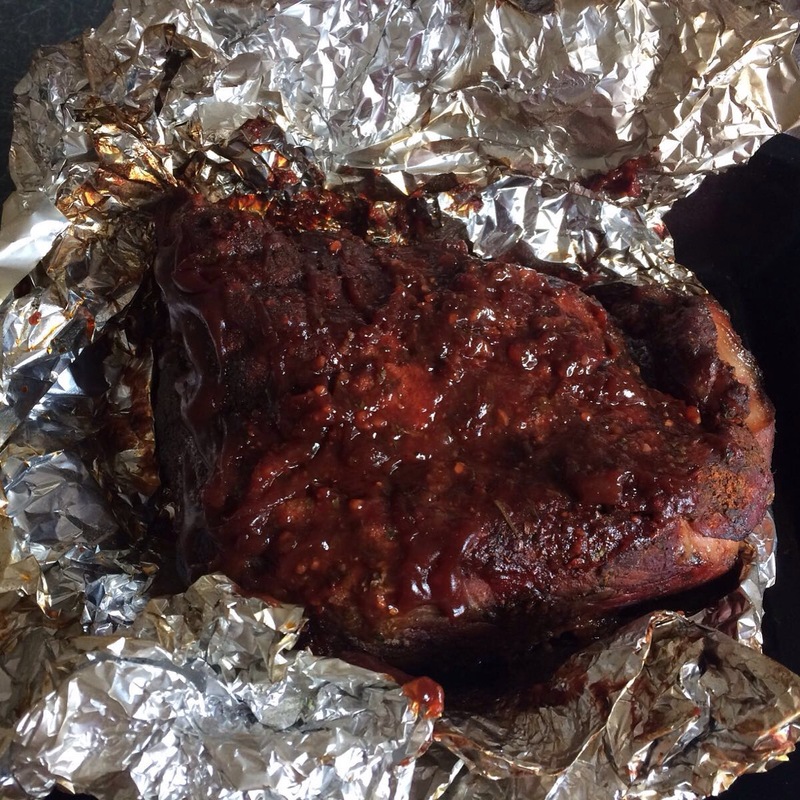 This series of blogs will document my progress and any mistakes or improvements that I made with each cook, hopefully culminating in some pretty good BBQ. I managed to time it wonderfully as I ended up buying it on my birthday, happy birthday to me indeed. I went for an offset unit that cost £89.99 from The Range in Willenhall (www.therange.co.uk for more details) and brought it back home to set it up. 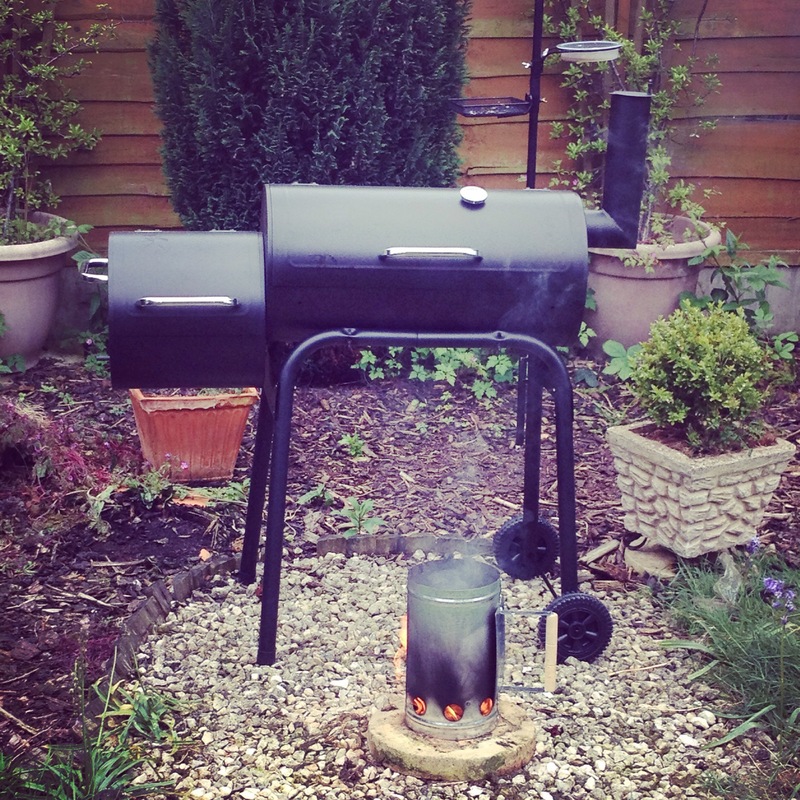 For those who were as new to this as I was when I started, an offset smoker is a large barrel like chamber with a chimney and a firebox for the coals. Usually these are at opposite ends but the more you read into them the more the internet tells you this is a bad set up, however with a few modifications the air flow and fire management can be greatly improved, but I will cover that in a later post. Find a solid, flame proof surface and split a few firelighters. Fill the chimney with coals and light the firelighters. Place the chimney onto the lighters and leave it well alone until the coals are burning hot and white. Add unlit coals to the firebox and place hot coals on top (This is called the minion method). When thermometer reads to temperature (Consult your recipe’s requirements) add the food to the grill and throw on the first hand full of wood chips. Initial set up was easy and took around an hour all together but would possibly have been even quicker had somebody else been there to help out a bit. As soon as I had it set up I slung the grills in and retrieved the few bits of dry rubbed meat that I had prepared in advance as per a recipe I found online. I loaded the starter chimney up with briquets and waited 20 minutes for the coals to turn white, now here is where my first mistake materialised unfortunately. When burning coals in a BBQ there are two crucial things that are needed which are; good air flow to feed the fire and enough space for the ash to escape away from it. Sound’s almost ridiculous when you think about all the summer BBQ’s you have had in your lifetime with charcoal piled high under the grill, but the ash that the coals sit in will strangle the fire and destroy any hope you had of controlling the temperature long term. With this in mind it pays to remember the basic principle of smoking food is to manage a the fire so it lasts as long as possible to cook the food slowly and indirectly. I piled the hot coals on top of raw unlit coals without any space underneath them which created a strong initial fire that died off within an hour and was really inconsistent all day. Second mistake was soaking the wood chips, with an already inconsistent fire this just didn’t help at all. A lot of manufacturers will advise you soak them in water for 30 minutes prior to adding them to the firebox but it turns out this is a ludicrously inefficient practice as they only ever absorb the equivalent of 5% of their overall mass. This and the boiling point of water is 100 degrees, meaning the heat around the chips can only ever be around this temperature. So if your fire is already crap like mine was this just won’t help at all. If you want to make them last longer wrap them in foil and put them on top of the hot coals. Last mistake I made was opening the lid too often. The guys among us will remember being told when you were younger ‘Don’t play with it or you will go blind’ now in this instance you won’t go blind but your pork shoulder will be tepid. Not a punishment on par with loss of sight but it still a bit of a buzz kill when you spend 10 hours trying to make something special to savage in front of Eastenders. Leave the lid shut until you need to baist or rotate, which should be no less than every 60 to 90 minutes unless you’re cooking something smaller or more delicate. So after around 7 hours I still had a certain amount of raw meat which I ended up having to finish off in the oven for half an hour, which I wont lie did still give me a brilliant smoke ring on the meat but not the same kind of gratifying feeling I was shooting for. Keep the coals out of the ash best possible to maintain the heat and make sure the airflow is sufficient. Don’t soak your wood chips. Its pointless and can ruin your fire. Wrap in foil if you want a slower smoke release. Leave the lid shut unless you really need to open it! Volume two coming very soon!